Are California’s public schools failing? Most Californians seem to think so, with 55 percent saying the quality of the state’s K-12 public schools is a “big problem” in a recent statewide poll. 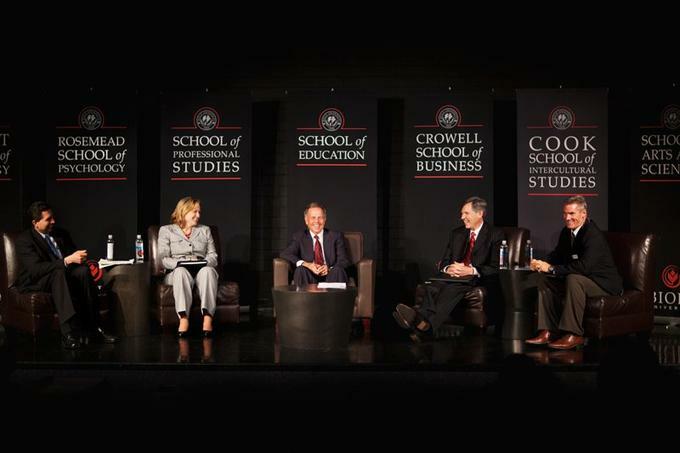 But many who hold a negative outlook aren’t getting the full story, a panel of experts said at a symposium hosted by Biola’s School of Education in April. “Right now we have a culture where, if you didn’t know any better and you’re just reading the paper, you’d think, ‘I would never go into education. I wouldn’t be a teacher,’” said Biola alumnus Glen Thomas (’68), who served as California’s secretary of education under former Gov. Arnold Schwarzenegger. Pointing to some positive trends, Thomas noted that California’s math and language arts scores have risen consistently over the past 12 years. Meanwhile, the number of black students in Advanced Placement classes has doubled in the past four years, and the Hispanic population continues to go up in achievement, particularly in elementary school, he said. “We have a lot of heavy lifting to do and a lot more work, but it is not as if we are failing,” he told an audience of 400 educators, students and community members packed into Mayers Auditorium. At the same time, California does face many real challenges, Thomas said. Among them, he said, are budget shortfalls, baby-boomer voters who don’t prioritize the needs of young families, politicians who are unwilling to compromise, citizens who don’t study the issues, and media outlets that tend to focus on negative news. Budget troubles, in particular, have led to staffing cuts, to the point that the number of adults working on the average high school campus is now half the nationwide average, Thomas said. These problems have been exacerbated by voter-approved initiatives that limit how the state’s money can be spent and judges who have mandated, for example, increased health care spending for prisoners. “When prisoners are costing us four and five times what a public school student costs, there’s something wrong with that picture,” Thomas said. Following Thomas’ address, a panel of education experts — including two local superintendents, Ruth Perez and Joe Gillentine, and Al Mijares, a Biola trustee and western region vice president of the College Board — joined Thomas to discuss issues facing public education, including upcoming legislation, demographic trends, the state’s economy and the role of Christian educators in the public arena.